Situated just behind the Penny Farthing Hotel, this is a modern two-bedroom cottage, with a safe enclosed courtyard to the rear, ideal for families with small children. 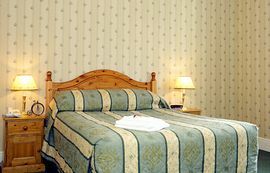 The main bedroom has a double bed, the second is a twin sharing a bathroom, complete with bath and electric shower. Downstairs is an L shaped lounge/dining room, remote control television and stereo (with CD). 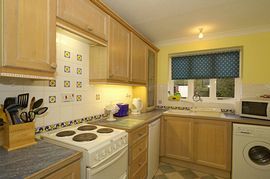 There is a modern kitchen with electric cooker, fridge, washing machine, etc.. Also a separate downstairs cloakroom and toilet. A small enclosed patio/courtyard area leads off the lounge/diner, to the rear of the property. The Name 'Alice' was taken from 'Alice in Wonderland'. "Alice" herself is buried here at Lyndhurst Parish Church. 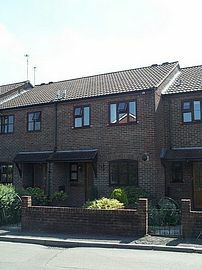 Alice cottage is ideally positioned for Lyndhurst village centre with its shops, restaurants, pubs, banks, etc. 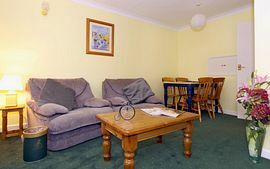 In our Cottages the emphasis has been put on quality furnishings, decor and appliances. Local Services: Alice Cottage is a 5 minute walk from Lyndhurst village centre with its shops, restaurants, pubs, banks, etc. Travel to Junction 1 of the M27 and follow signs for Lyndhurst on A337. The Hotel is on the left as you enter the Village, just after The Mill House Pub. We have a large car park behind the Hotel. Approaching Lyndhurst on A35 from Southampton, or having cut across the Forest via Beaulieu Road (B3056), you will see "LYNDHURST PARK HOTEL" (big hotel) on your left. As you head down, move to the RIGHT hand lane and keep RIGHT as you go around a Green and back up SHRUBBS HILL ROAD, still keeping in the right hand lane. At the top the road splits, turn right and then move into the LEFT lane and turn LEFT at traffic lights. The Penny Farthing Hotel is 250 metres along on the RIGHT and has a large car park to the rear. £650.00 per week from 1st January - 19th December. Christmas & New Year £750.00. "A week away staying in Alice cottage was lovely. Ponies & foals, cattle & calfs were so sweet. Every night we went for a stroll on the New Forest and ate out at a different place in the village, many thanks" Leroy & Carmel Tower-Block ~ Docklands, London.